It's got waay too many windows. And you know it's way too long. And It doesn't get good mileage. And yes, I know that it's just wrong. But if it's a BB Chevy Long Boy? Well then, it's Van ON! I'm sure that's crazy California code for something, but surely this thing runs and drives at that price point. Non-op where I'm from means inop, and inop means inoperable, and inoperable means it doesn't run, and it doesn't run means it costs$1000 max. Last edited by Rusty_Pancelode; July 25th 2018 1:33 pm. Kind of weird, usually CA non-op most likely means it didn't pass smog. But this guys says he'll smog it, which he has to do anyway, because he's the seller, and that's the rule. Maybe it wasn't used enough to justify full registration, because CA tags are $$$. 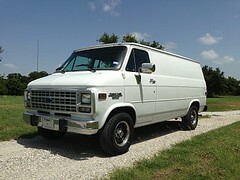 Why would the seller call it a Chevy van with a GMC big block? A 2003 model and then a 1994 with Upgraded AC ?? Non-op means he paid $10 & can not drive it on the road....may run great. Smog has nothing to do with it ... he chose not to reg this yr. To transfer title he MUST smog it. . . . unless its to a out of state where they dont require it. The price is avg for these.... Id have to see the vin to think about makin an offer. potatoe, potahto. usually people rather pay the non-op fee when something won't pass smog vs. potentially big $$$ to fix whatever is making it fail. Thanks for chiming in guys. I figured it was something like that, but didn't have any idea of the details. I spent a short stint in California about 10 years ago and it made my head swim at how much you have to know just to visit there. It's like another country to me. 4th Owner. Originally, a Los Angeles County Sheriffs vehicle. 2nd Owner was a Mechanic, who wanted to use it as a ChurchVan, but it was too difficult for Old Folks to easily ingress, egress. 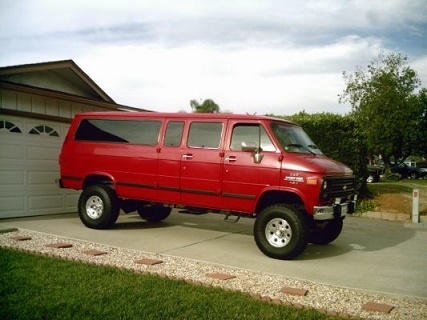 Bought 10 years ago from him by Gpa, who took all the Kids to the Grand Canyon in it. Current owner drove it while her car was being repaired.. Passed Ca. Smog easily when titled in Owner's name, Fall, 2016. Clean Pink, as per Owner. Registration is currently on Non-Op. status since last year, due to Van being down, (Fabricated hose,) when it came due. Good glass, lots of maintenance. IDK much, But. That is what I found out. Sounds like A Keeper!! With a heavy duty geared accordingly Posi rear end for all the Burnout contests!